And then there are the pre-empt signals, which permit trains to go through intersections where the trains and cars run in mixed traffic. Which I admit I have a tendency to short to “combination signals” and then even from that to “combo signals” because that’s altogether kind of a mouthful. 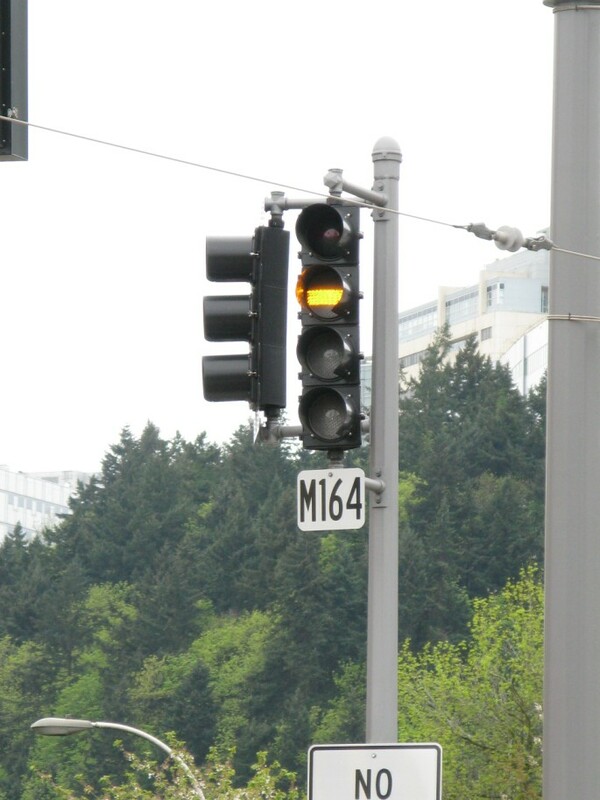 Remember how the number of aspects lit on an ABS signal tells you which route you’re going on? (one aspect = primary route; two aspects = secondary route; 3 aspects = tertiary route, etc). Well it’s the same with ABS/pre-empt combo signals. I’ll keep using W2 as an example. If it helps, here is the 11th Ave terminus from above. 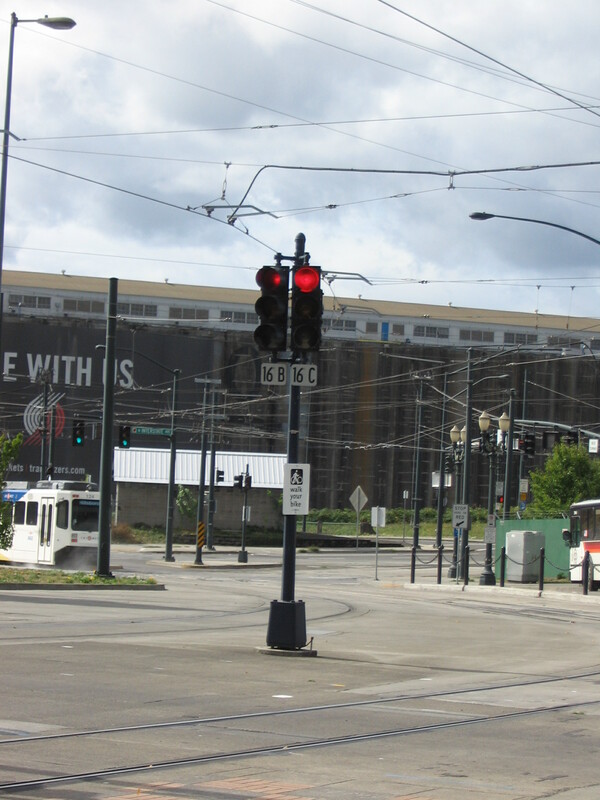 W2 is located on the corner of 11th and Morrison and is used by trains heading west. For Blue (westbound to Hillsboro) and Red (westbound to Beaverton Transit Center) trains under normal operating conditions, W2 will pretty much behave as a regular pre-empt signal once the operator places their call for W2 at Galleria. This indicates STOP and is what W2 looks like by default until an operator selects their route from the Galleria platform. 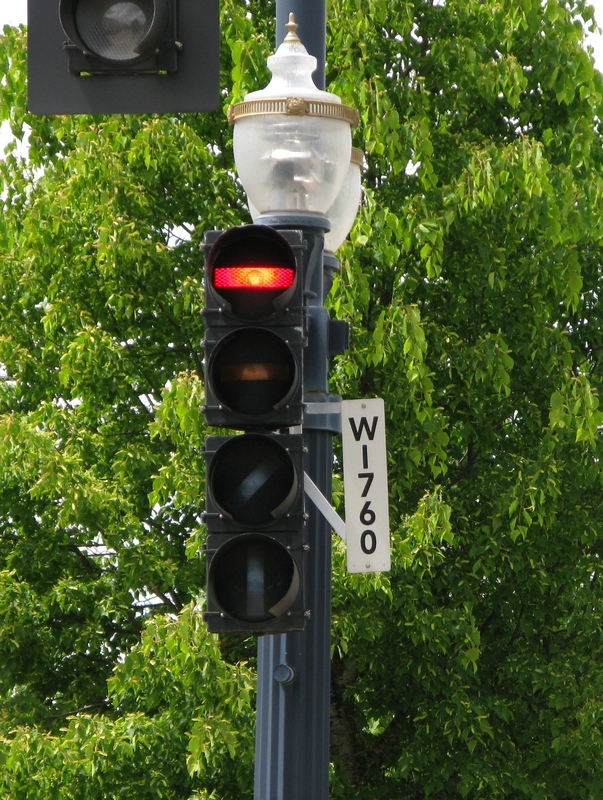 Similar to a red on an ABS signal, reds on combination signals will be associated with ATS magnets that a train cannot move over. Which, as you already know, indicates “proceed with caution.” Because you get dumbass cyclists like that one biking against the light. Good job, unknown cyclist – lucky for you that train was going straight and not going to hit you as you cycled across the diverging tracks! Here’s how the switches look to an operator – the train I was on when I took this photo was a Blue Line stopped at Morrison. This train would be continuing west instead of diverging into the terminus, and so the switches are set for the primary route, which is to head west towards Beaverton/Hillsboro. 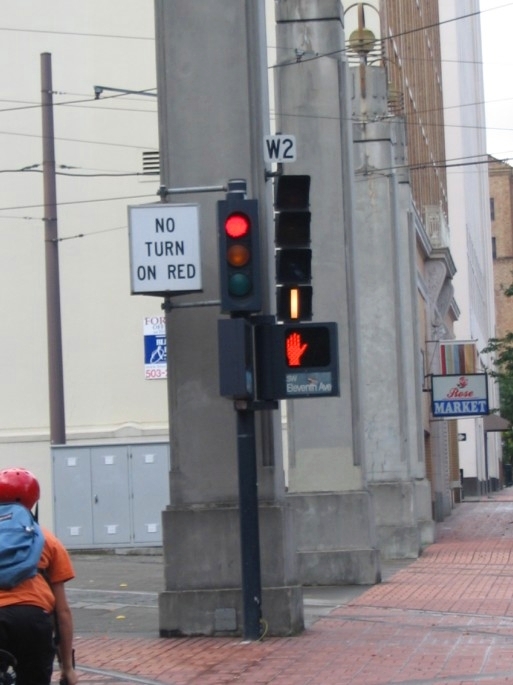 You can see the yellow horizontal on W2 in the top left corner of the picture, which indicates that the switches are set for the primary route but we can’t enter the intersection yet. The indication of this signal is “STOP – switches are set for something other than the primary route (more than one aspect), but you don’t have pre-emption to enter the intersection yet” – these aspects would display for trains diverging into the terminus after their switches were set and before the permissive white pre-empt aspect(s) came up. 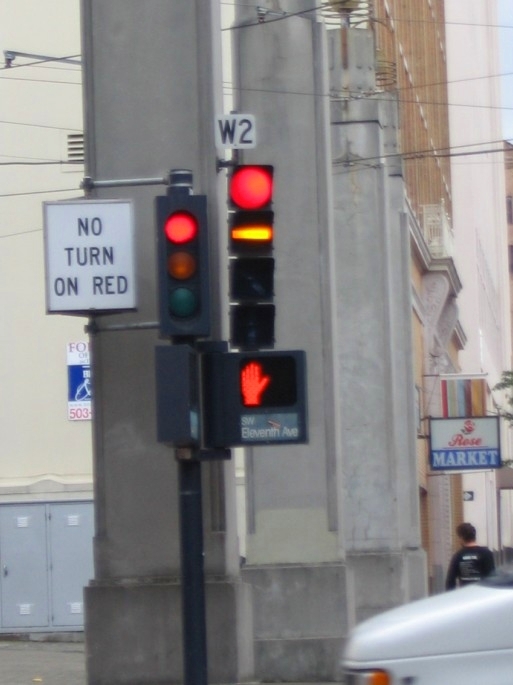 So my picture of W2 showing a red over white diagonal over white vertical aspect indicates permission to proceed with caution on the tertiary route. 3 aspects = tertiary route. The tertiary route from W2 is the easternmost diverging track into the terminus. A secondary route on W2 would be the red aspect over just a white vertical, but I never got a picture of that – if all tracks at 11th Ave were empty, a Yellow Line train would first be put in the tertiary track, and the secondary track would be used if another Yellow Line train entered the terminus while the first was still there. That didn’t happen while I was standing there taking pictures that day. Other combination signals that will show these same indications for primary, secondary, and tertiary routes can be found at end of the line signals W1760 immediately prior to the terminus at Hatfield in Hillsboro, and M164 which is the combo signal immediately prior to the Jackson turnaround for Yellow/Green Line trains at PSU. 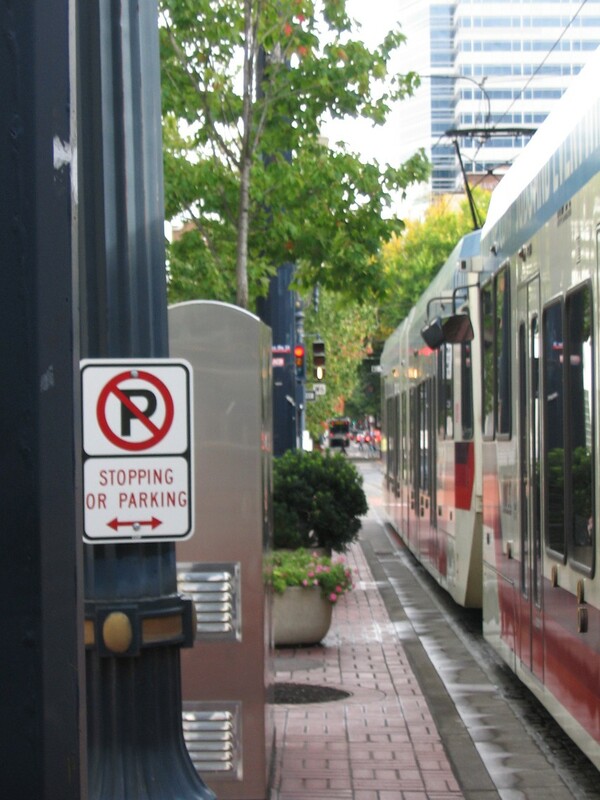 There is also 18B into Rose Quarter from the east, which allows a train to continue on the normal westbound track (primary route), the special events track (secondary route), or the Vintage Trolley barn (tertiary route). On the other side of the 11th Ave terminus for eastbound trains is signal W6, another combo signal. 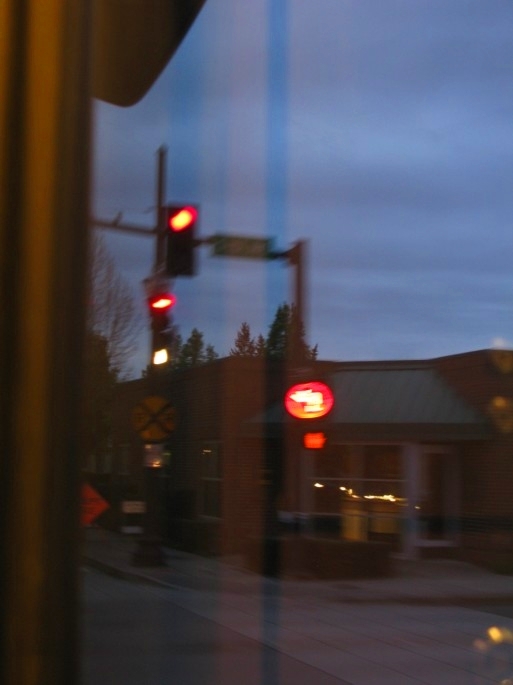 An eastbound train coming up Yamhill can’t enter the terminus so W6 isn’t there for route selection, but a red on it will indicate that something else is in the circuit – either a train leaving the terminus, or a streetcar on 11th Avenue. Permissive white vertical on W6 & eastbound train – you can see that the train that was pulling out of the terminus in the picture above this one is far enough ahead that it’s safe for this eastbound train to keep going. 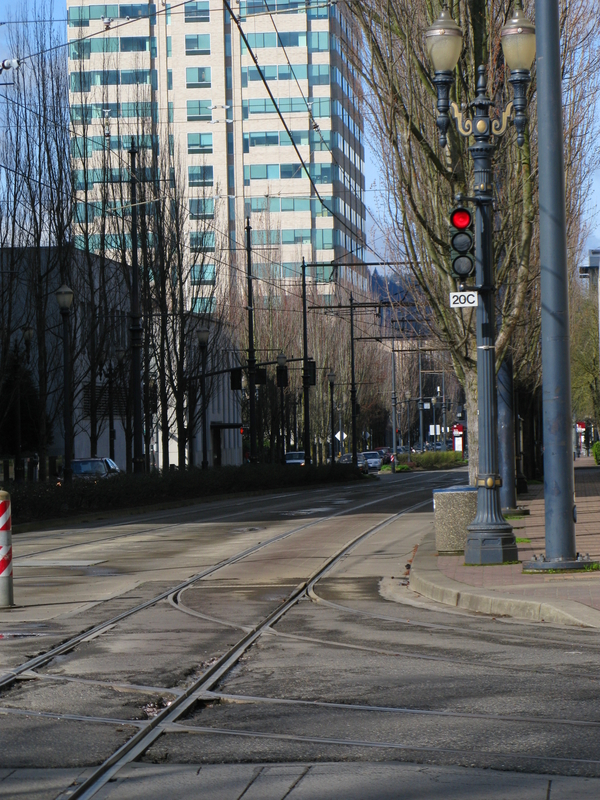 There is a siding track that diverges off Holladay at 11th which used to be used by the Vintage Trolley and is occasionally used by MAX trains taken out of service (and yes, another combination signal – 20A – is used to make that diverging move). Signal 20C at Lloyd Center westbound is associated with that siding track. A train facing this direction has no option to choose a different route, but the combo signal will prevent a westbound train from moving forward if a train is going to go into or come out of the Doubletree Siding. All signals leading to the Steel Bridge (on the east side of the river that’s the Rose Quarter platform for Blue, Red, and Green trains and Interstate Rose Quarter for Yellow trains; and on the west side of the river that’s the Oldtown/Chinatown platform for Blue and Red trains, and the intersection of NE 3rd & Glisan for Yellow and Green trains) are combos. Whenever the bridge is lifted, it throws up reds on all of those surrounding signals. 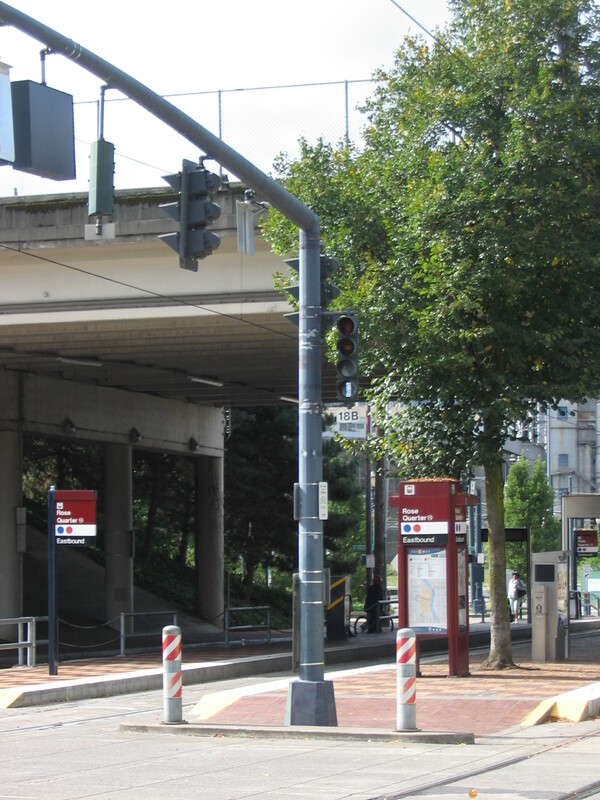 As mentioned in the Automatic Train Stop post, although a yellow horizontal and a red both indicate STOP, a train still can physically move on a yellow horizontal, but it (by default) can’t move on a red. So as soon as the bridge span is unlocked for a lift, all trains will be prevented from getting anywhere near it. 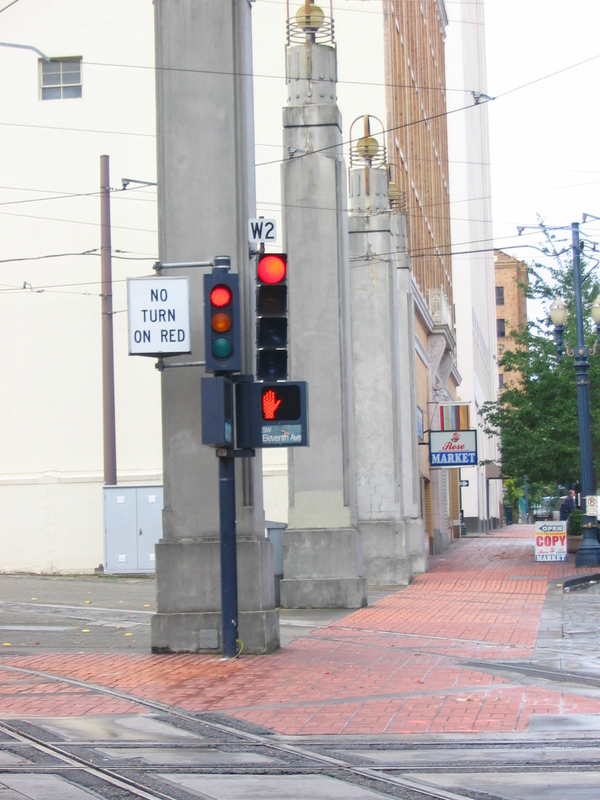 The interlocking of tracks around the Steel Bridge is extremely complex – on the west side, the Yellow and Green Lines cross the Steel Bridge from a different angle than the Red and Blue Lines, and then on the east side the Yellow Line turns north towards Expo and the other lines continue east. Since all of those moves are done through switches in the rails, the combination signals will also display reds if another train is making a conflicting move (e.g. if a PSU-bound Yellow Line at Interstate Rose Quarter leaves the platform just before a westbound Red/Blue/Green line train tries to leave Rose Quarter), or if the switches aren’t set right for you – this is why sometimes you will be sitting on a Yellow or Green line train at 3rd & Glisan waiting to cross the bridge for a while (which means a Blue or Red left Oldtown/Chinatown and got onto the bridge before you got there), or similarly be sitting at Rose Quarter on a Blue, Red, or Green train waiting for a Yellow Line to get out of the way. stopping a train if the Steel Bridge is going to be lifted. 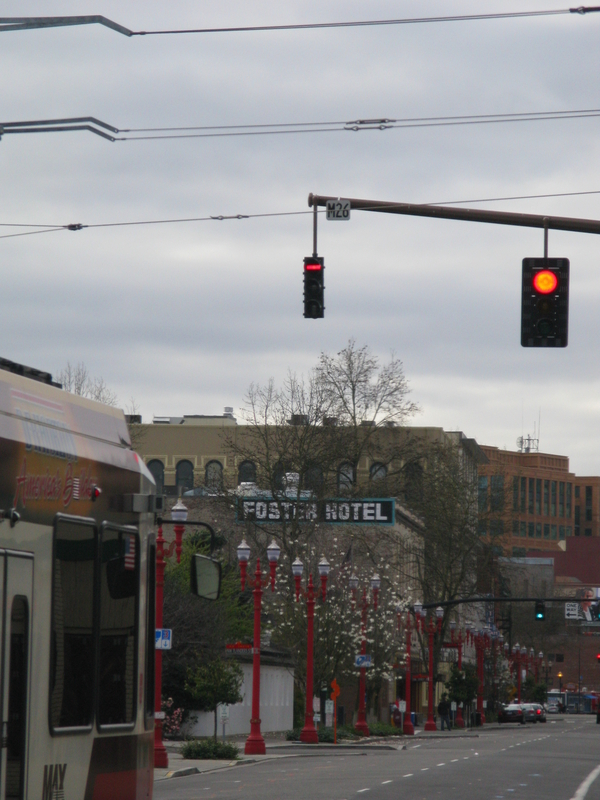 And that pretty much covers the last of the 3 major signal types used on the MAX light rail alignment. This entry was posted in alignment "what is? 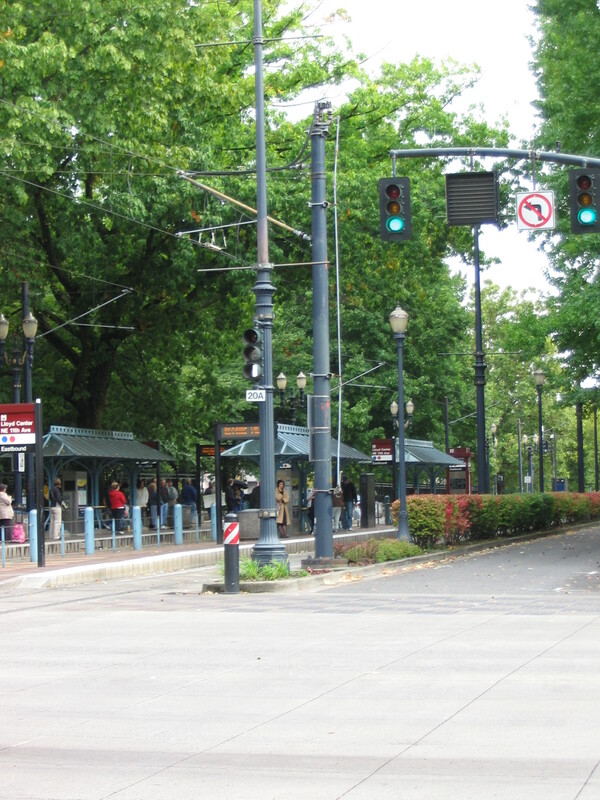 ", signals and tagged abs, abs signals, light rail, max train, portland, pre-empt, pre-emption, public transit, public transportation, rail, rail signals, railroad, railroad signals, safety, signal, signal pre-emption, signals, steel bridge, traffic, trains, trimet. Bookmark the permalink. I was hoping/wondering if you could possibly please explain the last signal before Hatfield..I think it’s a combination signal but I haven’t been out there for a while. 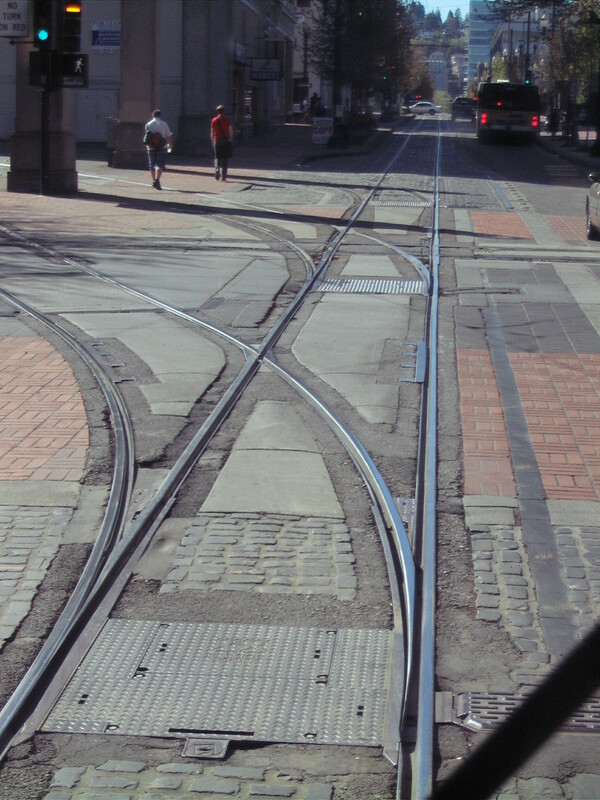 Also, do you know how it’s possible that the TWC code for the Main Street Pocket Track is the same as the TWC code for Gateway – EB Main (From PDX)? 1. That last signal before Hatfield is W1760, which is a combination signal, and it shows the same aspects as W2 (I’d just spent more time taking pictures of W2 than W1760 so that’s why I used W2 as my example in this post). There are three tracks in the Hatfield terminus – the primary and secondary tracks, and then the auxiliary track (which is the tertiary route). Most trains going to Hatfield use a route code that means “either open track at Hatfield”, i.e. the primary or secondary track. Some trains are scheduled to pull into the auxiliary track so they’ll be using a different route code. Anyway, an operator will place their call for Hatfield when they’re at Hillsboro Central. If they’re aiming for either open track, W1760 will display a white vertical if the primary track is open, or a red over a white vertical if the secondary is open, which is the blurry picture I posted here. 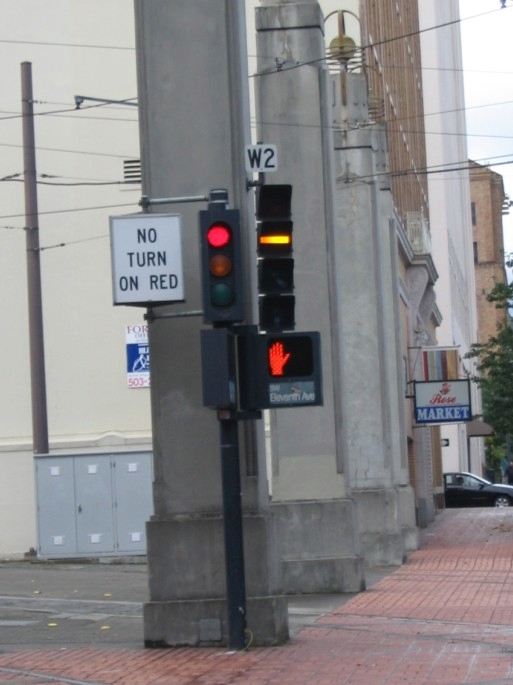 If they were aiming for the auxiliary track, it will display a red over a white diagonal over a white vertical. The only difference between W2 and W1760 is that the red aspect is round on W2, and it’s a horizontal bar on W1760, but a red is a red is a red, doesn’t matter what the shape is it still means the same thing. 2. They can be the same because they’re used by trains in different places. A train at Main Street is in an entirely different circuit and location than a train at Parkrose, so the route code is going to throw the switches for what is immediately in front of them. In sort of the same way, the route codes for the storage tracks in the yards are the same, but you won’t end up at, say, the 6th track of the Elmonica yard if your train is in the Ruby yard and you’re trying to get to storage track 6 there. You’re very welcome! I’m always happy to chat about this type of thing with anyone else who is interested in it. 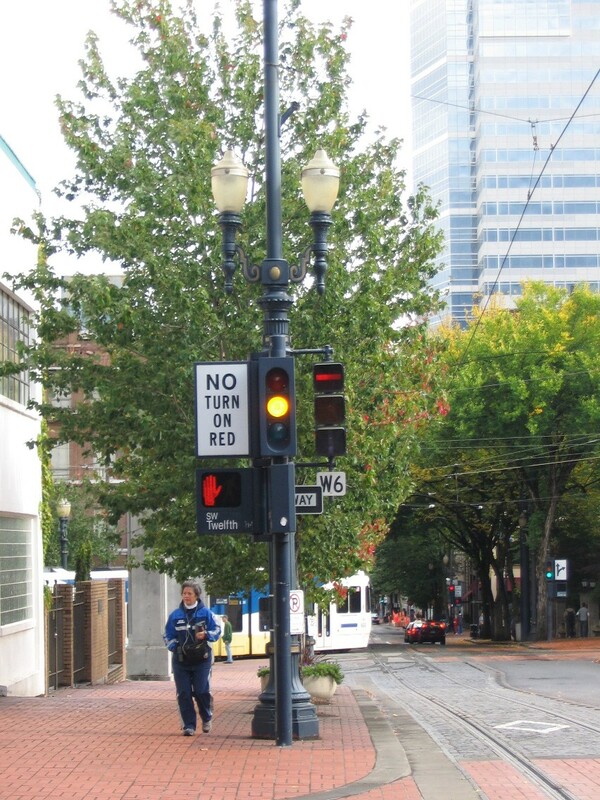 Re: 20C – does not protect the 15 crossover (the manual hand-throw switch between 7th Avenue and Lloyd Center). Manual hand-throw switches, even in girder rail territory, are not tied into the signal system. Remember, you can trail a mainline girder rail switch when set against you – therefore nothing to worry about stopping trains. A move out of the trolley siding is a whole nother story. You know, I didn’t think to check my alignment book if that was manual or power and I’ve been working under the assumption that you can’t tell by looking at a girder rail switch since it lacks indicators, and therefore have largely been making the assumption that most of the girder rail switches are power (except for the ones that I knew are not). Though now I am also thinking you should take this over from me! No – you’re doing a fine job. I just like filling in little details here and there. Well thanks! And I like having the details filled in (and inaccuracies corrected), even though I’m not like a spokesperson or anything like that and this isn’t an official TriMet publication by a long shot, but I’d prefer to have good information up at least! Huh, didn’t realize I did that. Good catch! Fixing it now. Good thing nothing on this blog is official information!